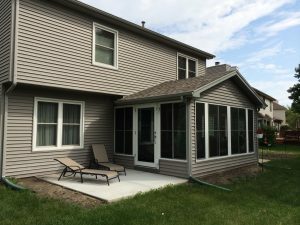 SRA Home Products offers patio enclosures that can turn any porch in Manahawkin, Sewell, or another community in New Jersey, into a comfortable and inviting area for entertaining and relaxing. We are proud to install beautiful TEMO sunrooms and screen rooms, products that can turn your porch from ordinary to extraordinary, giving you and your family more living space and potentially increasing your home’s overall value. Screen rooms – A TEMO screen room gives you the opportunity to enjoy fresh air without being bothered by annoying insects. Available in two styles, the traditional Studio and the dramatic Cathedral, our screen rooms offer heavy-duty aluminum construction, high-quality vinyl sashes, and solid thermal roofs that keep porch enclosures comfortable, regardless of the season. Sunrooms – When we use TEMO products to turn your patio into a gorgeous sunroom, you’ll discover that every day is a vacation! Featuring, TEMKOR polymer wall panels, thermal core EPS insulation, and energy-efficient windows, your new sunroom will be a comfortable haven for many years to come. Furthermore, our sunroom patio enclosures are available in numerous styles that will complement virtually any architecture, so you’ll be sure to find the sunroom design that suits your home and your tastes. Additionally, you can be sure your patio enclosure will be installed to your exact specifications because SRA Home Products has earned an A+ rating with gold accreditation from the Better Business Bureau, as well as the trust of thousands of homeowners. For more information about patio enclosures for homes in Manahawkin and Sewell, NJ, and other areas in the Garden State, contact SRA Home Products today.